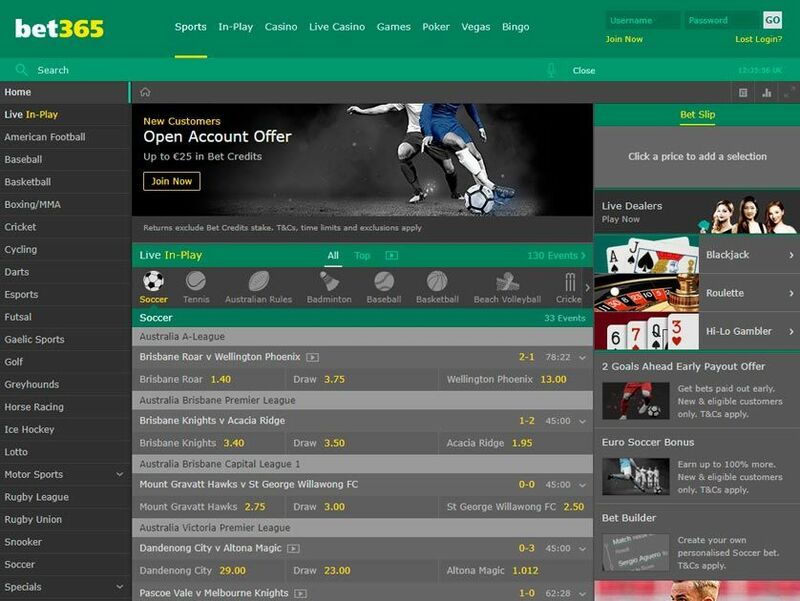 The Bet365 sports betting site is the biggest online bookmaker in the world, offering a massive selection of gambling options to its many, many different members. There’s a reason why this has become the world’s top sportsbook, and it’s this: there’s nothing missing from their line-up at all. This means you’ll find big bonuses (including a nice sign-up bonus), loads of football betting markets, and some of the best customer service in the online betting world. Why not try Bet365 out today? We’re pretty sure you’ll absolutely love it when you do! It doesn’t matter what you’re looking to bet on, as you’ll find it offered at Bet365. Football, basketball, tennis, rugby, horse racing - you’ll find them all at the Bet365 betting site, plus much more. You might think that the site will be confusing to navigate, due to its sheer size, but it’s actually really easy to use. Just a couple of clicks and you’ll be on the page you need, then after a couple more clicks, you’ll have placed your bet. When you do bet, you’ll often find that the odds are the best in the industry, as Bet365 are known for being one of the more generous online bookmakers. But what about football betting at Bet365? Well, they’ve got you covered from every angle. No match is missed, and coverage of the biggest games is more comprehensive than anywhere else in the online sports betting world. We also like the fact that matches from far-flung leagues are also offered. Anyone fancy betting on the Algeria Youth League, or perhaps having a punt on a game in the Macau 1st Division? Football betting is also possible in-play, with loads of games offered in this way. Whatever you are looking for in the world of football betting, you’ll almost certainly find it at the Bet365 online bookmaker. 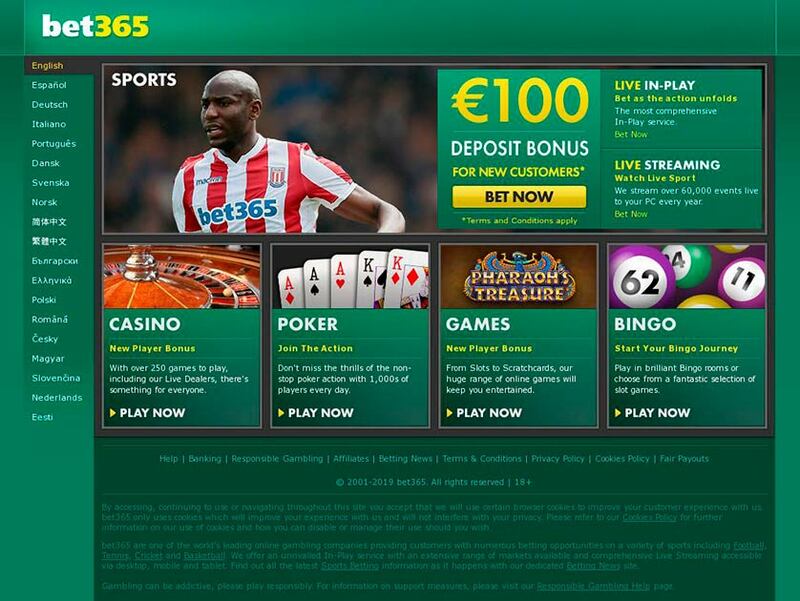 Every good sports betting site should have a superb sign-up bonus, and this is certainly the case at Bet365. This welcome bonus gives all new players up to £100 in free bets, which is absolutely stunning. Effectively, you’ll find that you’ll receive free bets worth the same value as your first deposit. There is no bonus code for this bonus - in fact, there are rarely any Bet365 bonus codes. Instead, all bonuses and promotions are automatically added to your sportsbook account. If you’re looking to claim this bonus, don’t deposit using Skrill, Neteller, PayPal or Paysafecard. This is because you’ll have to go through a long process before your bonus funds are credited to you. Instead, deposit using your credit or debit card. The minimum deposit required to claim this bonus is just £5, which is great for those who prefer playing at lower stakes. Finally, every free bet must be made on selections with odds of 1/5 or greater. As you’d expect from such a massive online bookmakers site, there’s a fantastic Bet365 mobile app. This mobile app is completely free to download, and both an iOS app and an Android app is available. These apps are updated very regularly, meaning that they’re always completely up to date, plus the app always offers a staggering array of different markets, as well as the chance to bet on games in-play. In fact, the Bet365 mobile app is so good that some people use it even when at home, preferring it to the desktop user experience. Even if you don’t want to download the mobile app, you can still play using a smartphone or tablet. Just simply tap the Bet365 URL into your browser and you’ll be taken to a fully optimised mobile site. The layout will adapt to fit any screen and no device is excluded, providing it has a touch screen and an internet connection. Mobile betting really doesn’t come any better than the experience you’ll find when you play using your mobile at Bet365! The Bet365 customer service team is one of the best around, offering loads of useful answers and advice every time they’re contacted. Most will choose to use the live chat feature, which can be accessed via the “Help” section, and this live chat feature is staffed by customer support agents 24/7. There’s also a 24/7 phone support option, plus they can be emailed too. They’re also on both Facebook and Twitter and tend to reply to messages pretty quickly on both social media platforms. You’ll also find a massive “Help” section at this site, so there’s a good chance you can find the answer you’re looking for without having to contact customer service. There are loads of different ways to deposit at Bet365, however we’d stick to using VISA or MasterCard, as other options make claiming the welcome bonus tough. One of the best things about depositing at Bet365 is how little and how much you can deposit. The minimum deposit is just £5 using most methods, while the maximum deposit is a massive £100,000 - a sum that will be more than enough for nearly every Bet365 player. Deposits are instant when using most options, and there are no charges for adding money to your sportsbook account. The withdrawal time at Bet365 is pretty good, as most requests are processed within 24 hours - the majority of other sites take around 48 hours to process their payout requests. Please be aware that the withdrawal time might be longer if you’re asked to provide ID though - something that only happens rarely. The minimum withdrawal amount is just £5, which is fantastic, while you can withdraw a maximum of £100,000. As with depositing, there are no charges for making a withdrawal at this online sports betting website. You’ve probably seen the adverts before, and now you’ve read through this review. 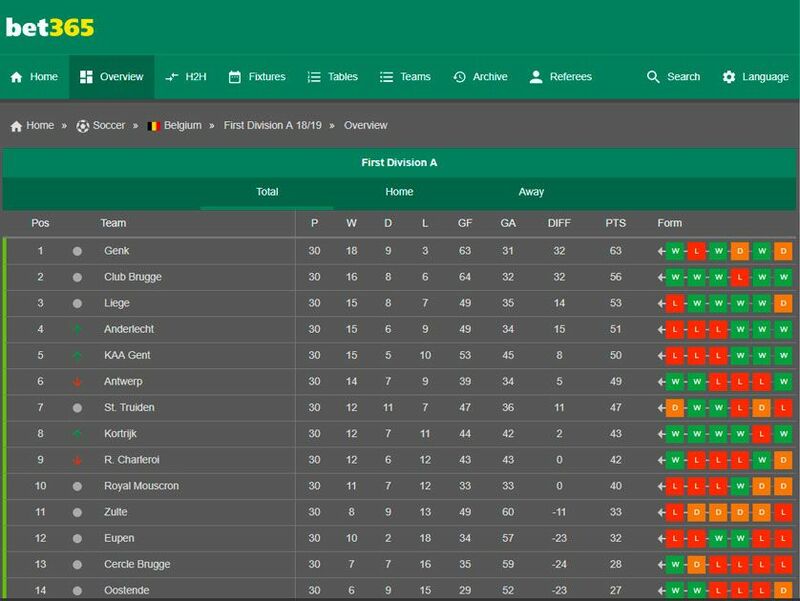 After taking everything in, it should now be clear that Bet365 is the place to be for those looking for great football betting opportunities. The massive sign-up bonus is the perfect welcome to the site, giving you loads of free bets, plus you can play using a desktop or mobile device. There’s also fantastic customer support, plus it couldn’t be easier to make deposits and withdrawals. We know that you’ll love everything that Bet365 has to offer, so why not head over there today? You’ll get a stunning new customer offer when you do!